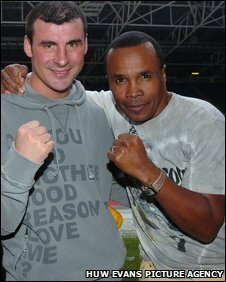 Joe Calzaghe has been warned against a return to the ring by boxing's comeback king Sugar Ray Leonard. The 36-year-old two-weight world champion retired from boxing unbeaten to emulate the achievement of the great heavyweight Rocky Marciano. 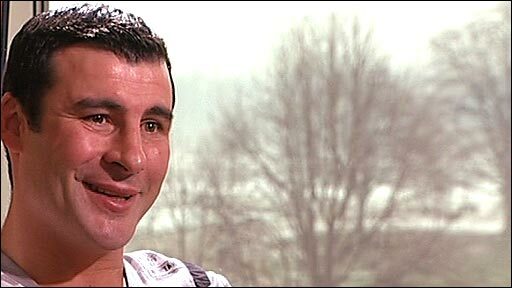 But Leonard, who memorably made three comebacks, says Calzaghe's resistance will be tested by big money. "If you are an undefeated champion, there will always be an offer on the table," Leonard told BBC Sport. The legendary five-weight world champion was Calzaghe's boxing hero as the American defeated Robeto Duran, Thomas Hearns and Marvin Hagler in their great duels of the 1980s. Leonard beat 'Marvellous' Marvin in a mega-rich Las Vegas showdown in 1987 in one of his infamous comebacks but endangered his legacy with two defeats in two encores as an old man in the 1990s - losing as a 41-year-old to Hector Camacho in 1997. Calzaghe, who ruled the super-middleweight division for a record 10 years later beating Chris Eubank for the vacant WBO crown in 1997, hung up his gloves on a sensational 46-fight, 15-year career on Thursday. The Welshman told The BBC he "achieved everything he wanted to achieve" and had "no other goals to go for." Calzaghe defeated American superstars Bernard Hopkins and Roy Jones Jr in his final two bouts in the United States and rejects a call for a rematch - but concedes: "You can never say never in this game." But Leonard told BBC Radio Wales The Back Page programme: "When you are a retired fighter, you are just one big purse away from a comeback. "For a fighter to say 'well I've done my share and fulfilled my dream, I can happily walk away' is tough, the majority can't do that. "He has accomplished everything he wanted and his legacy is submitted, he has achieved something quite significant. "Retiring is a good move if he is not totally motivated or his head is not in the right place, then it is time to quit. "Joe knew within himself it is time to go, fighters do know. Unfortunately I didn't know as we are kind of selfish about making that decision. "Joe will will question himself but he has done the right thing," insists Leonard. Calzaghe's legacy has been questioned by some critics who claim the southpaw did not fight the best boxers in the world at their peak. Calzaghe beat 43-year-old idol Hopkins in Vegas and 39-year-old Jones Jr, the great four-weight world champion, at Madison Square Garden in a fitting finale - but there is an argument both were over the hill. Calzaghe's career defining victory was his virtuoso destruction of previously unbeaten American Jeff Lacy, the man hailed has the 'next Mike Tyson' and the bookies favourite, in their unification clash. That points victory was the one of the most one-sided displays in recent decades and his defeat of Mikkel Kessler, a fighter with the talent to succeed Calzaghe as the super-middleweight king, to become the undisputed 168lb division champion in 2007 was a boxing masterclass. "You have to deal with the hands you were dealt," said Leonard. "You can't please all of the fans, all of the time. There will always be someone that will say you should have fought someone. "Joe Calzaghe was supposed to be an easy opponent for Jeff Lacy to annihilated and that was a huge, huge upset for the boxing critics and historians and even myself and I didn't think Joe could beat Jeff Lacy. "And even though Roy Jones was past his best, he was expected to beat Joe with his handspeed and knowledge. "Joe has proven himself and beaten everyone that people claimed he couldn't beat with class - and that is respectful. "Joe was a special kind of fighter."